Some people will be surprised that Owen Clarke Design is delving into the world of the medium size IRC racing and Fast 40 sailboats. However, they shouldn’t be. Compare the values in the table below for the displacements and sail areas of the Ker 40, as an example, with those of early and later generation Class 40s. It’s the latest IRC rating rule designs that have steadily increased sail area, reduced displacement and so now come within our sphere of expertise. It’s unlikely any design office in the UK, and few worldwide have completed as much work on high performance hull shapes and appendages for yachts as OCD in the last twelve years. We believe we’ve got something new to offer, a game changing winner. The Ker 40 is an excellent example of a modern design that is competitive under IRC and can be sailed to its rating. However, clearly a one design class yacht cannot have an advantage over a wide range of conditions. It has to have a range in which it performs best. That will always be its disadvantage when it comes up against yachts optimised for local conditions and/or a particular kind of sailing. This is what is in this offering from OCD for those owners who want something different and/or want to be involved in the design and build of their own boat. OCD have been approached on a number of occasions in recent years to tender for the design of fast rating rule racing boats in the 35’ to 52’ range. We’ve always turned down the opportunity for fear of not having enough time to fully develop a competitive design. We wanted our first step into mid-size IRC racing to be a ‘Kingfisher moment’, a new and winning concept, and to do that we needed time. Work on the design of this offshore biased, inshore capable design finally began in 2011 in response to the demand from a number of owners who’d contacted us previously enquiring about Class 40. We’ve handled dozens of enquiries in the UK alone from potential owners who were excited by that class, but were put off by the uncompetitive rating of the boats under IRC. Although attracted to the idea of sailing fast with less crew, they wanted to race predominantly in shorter distance, IRC rated events. The demand existed therefore for an offshore performance orientated racing boat, so long as we could strip out the aspects of the design that made Class 40s rate badly, while maintaining their great handling characteristics and as much of their pure performance potential as possible. The question was; would the hull and appendage configurations we’re known for be the solution or would we end up developing a more conventional design, perhaps with a single rudder? First we gathered weather data for various areas around the French and British coastline, the English and St Georges Channels. We already had a meteo library extending out into Biscay, the Azores and across the Atlantic, as these were the areas we were used to optimising our boats. 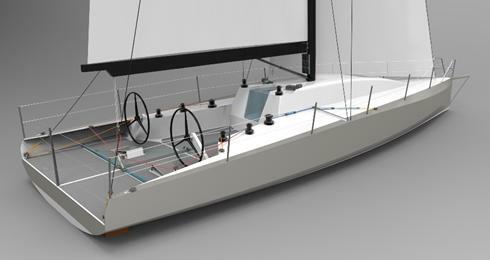 Since the design would also have to compete in inshore regattas information was sourced for March to November for well known venues such as the Clyde and the Solent. Our study extended to the Caribbean and North America looking at Key West, Lake Michigan and Long Island Sound, since several enquiries had come from those waters. We already knew from having raced a good deal on the east coast that the average wind speed in Newport RI over the summer is a ‘dismal’ 8kts, but offshore at Block Island it’s a full two knots greater. In the Solent, in August the average wind mid afternoon is a moderate breeze, force 4, two knots greater than mid-morning. Over the racing season the mean wind speed in the middle of the English Channel, south of the Isle of Wight is more than three knots greater than in the Solent. The obvious conclusion was that there was a real possibility that we wouldn’t be wasting our time undertaking studies of conventional IRC cruiser-racers, some of the latest designs from the ‘usual suspects’ and comparing them to candidates of our own. This initial feasibility study entailed developing datum designs from measurements taken in boatyards and from RORC certificates for existing boats. Race modelling using WinVPP and Router reinforced our initial impressions that for races such as the Sydney to Hobart, as well as in North West Europe, the Caribbean, including Key West and some other classic regatta locations there was likely to be a strong case for a design optimised around higher mean wind speeds. Higher than those we perceive some current designs are targeted at. Conservatively we estimated that a target TCC of 1.22 would put us firmly in the ballpark and so we began work on optimising the two best candidates we had developed. Although this process didn’t begin with people wanting to race the design double-handed, with entry numbers of more than seventy IRC boats in the RSYC double-handed series, nearly sixty boats in the AZAB /RBR classics and a double-handed division in RORC events we weren’t going to ignore the fact that with water ballast this type of boat would suit that type of racing. The first trial certificate we received from RORC was for an un-ballasted twin rudder design with an IRC displacement of 5110 kg and a TCC of 1.212, nicely below the target we set ourselves during the feasibility study. The natural progression was to then develop among the options the inclusion of water ballast. The final result is two distinct designs, with the same hull type, but with the rigs and keels in alternate positions relative to the stem, thereby optimised for different conditions. The hull and appendages are a development of successful Class 40 designs. Proven high performance, dynamically stable, both easily driven and capable of being pushed hard in moderate breeze and in waves. On the offshore design, the forestay attaches well aft of the stem, evidence of the keel’s position further aft than is the norm in IRC to date. The J measurement is longer than typical and we willingly pay a small rating penalty for that and the 188 square metre spinnaker, which because of the high righting moment, hull design and twin rudders, the sailors will have no difficulty handling in more wind than they’re used to. In performance terms, despite having a TCC that is 55 points lower, on elapsed time both the inshore and offshore designs perform better than any second generation Class 40s under a wide range of conditions. On elapsed time, with a final trial TCC of 1.213 and with water ballast 1.225, both boats proved competitive when raced in a computer model of the 2012 Round Ireland Race. This event suited our purposes because it happened at a convenient point in the design cycle, included an Akilaria Class 40 sailed with five crew and featured two of the datum boats; Tonnerre de Breskens and the winner of the actual race on the water, Inis Mor. Construction will be cost effective, epoxy glass foam sandwich for both inshore and offshore boats, designed and engineered to ISAF OSR Cat 1, with Cat 0 as an option. Without pre-judging the tender process currently underway our expectation is that build costs will be less than or equivalent to a Class 40 and obviously would be driven lower if multiple units are built in any one yard. A number of builders around the world have received tender packages including Jaz Marine in South Africa, builder of six of the fourteen OCD designed Class 40’s. The owner has a choice then whether they build the boat overseas where build charge out rates are potentially lower, or enjoys close up the thrill of putting together their own design/build project, as well as supporting the marine industry of their home nation. Finally, to answer one question: Is this boat designed for the new HPR rule? No, but it doesn’t take too much imagination to look at the numbers, specify construction in carbon, increase the draft, tweak the hull and you’d get in the range pretty quickly.